We’re just back from an outstanding weekend in Pembrokeshire, two days which saw us walking miles of coast path, watching Manx Shearwaters returning to their burrows and sitting just inches away from bow riding Common Dolphins. To say that we enjoyed ourselves would be an understatement and perhaps unsurprisingly I’ve got lots to share over the coming days. To kick off though let’s travel to Pencarnan campsite just north of St David’s, a gorgeous setting currently playing host to this chap. 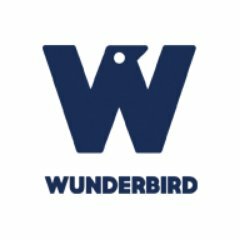 Now depending on how closely you follow avian events this bird will either spark a pang of recognition or leave you scratching your heads. 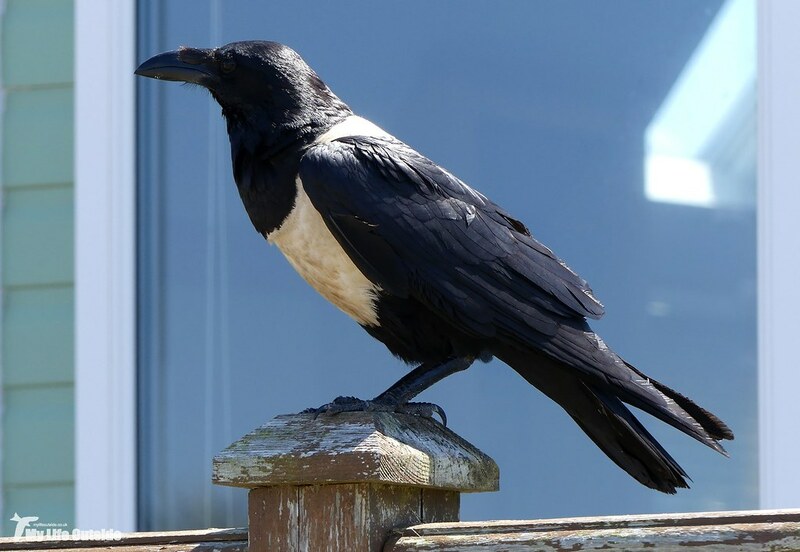 The former group will know it as the Pied Crow which first made landfall on these shores back in June, spending a week or so enjoying fish and chips in Cromer way over on the east coast. From there it moved across to Clevedon and on Wednesday last week turned up outside a caravan in Pembrokeshire. Not a bad little journey and one which has allowed plenty of people across the country to connect although it has to be said, not without a small degree of controversy. Being such an approachable individual inevitably raises questions as to origin with some calling this out as an escaped captive bird. Others favour a ship assisted arrival from the species’ native southern Africa. For what it's worth I didn’t really care and as we were in the area anyway it was a no-brainer to pop along for a look. Our search initially concentrated on the surrounding fields which seem to be some kind of corvid mecca. 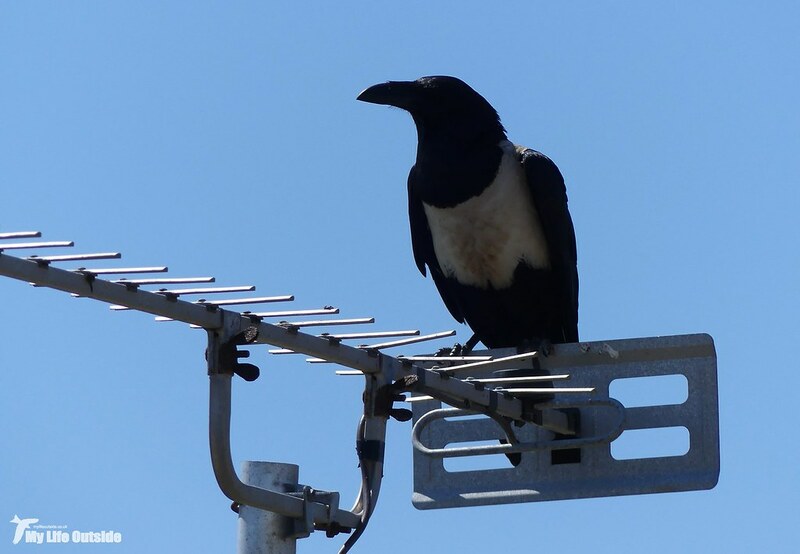 Everywhere we looked there were Rooks, Crows (of the Carrion variety) and Jackdaws with even a troupe of five Chough putting in an appearance overhead. All were methodically categorised but none showed the distinctive white flash which would mark out our quarry. It was only thanks to the very kind invitation by a resident on the campsite itself that we ventured into the prime area for sightings, just the first of several people who went out of their way to make us feel welcome. That first lady went to the trouble of searching the entire area with us and even pointed out favoured feeding spots and described recent behaviour. 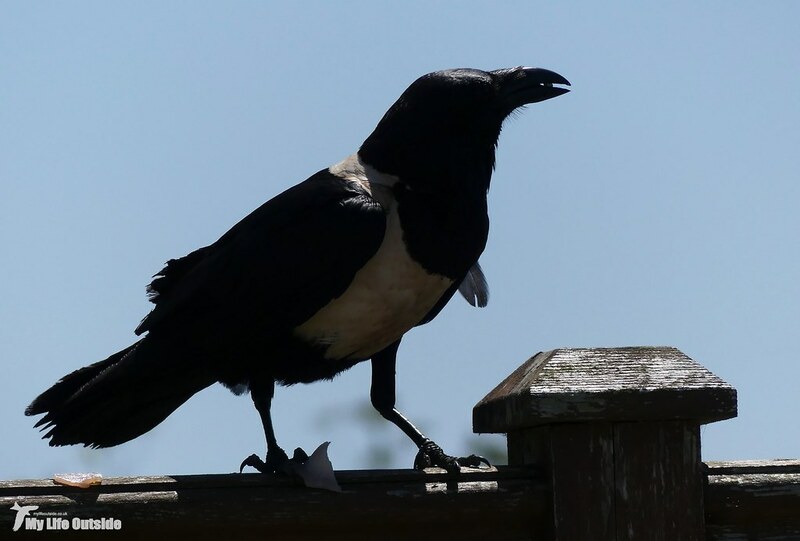 All to no avail it has to be said as on that first visit the Pied Crow remained resolutely absent. With temperatures once more troubling thirty Celsius we had one last sweep before heading down to nearby Porthselau where I enjoyed the shade whilst Emma went for a swim. 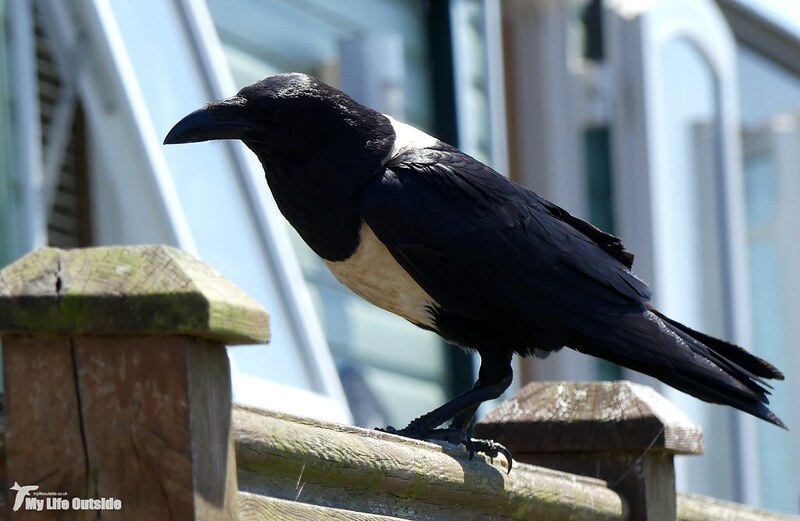 Suitably refreshed we gave Pencarnan another look and low and behold found the Pied Crow sat atop a section of caravan decking. 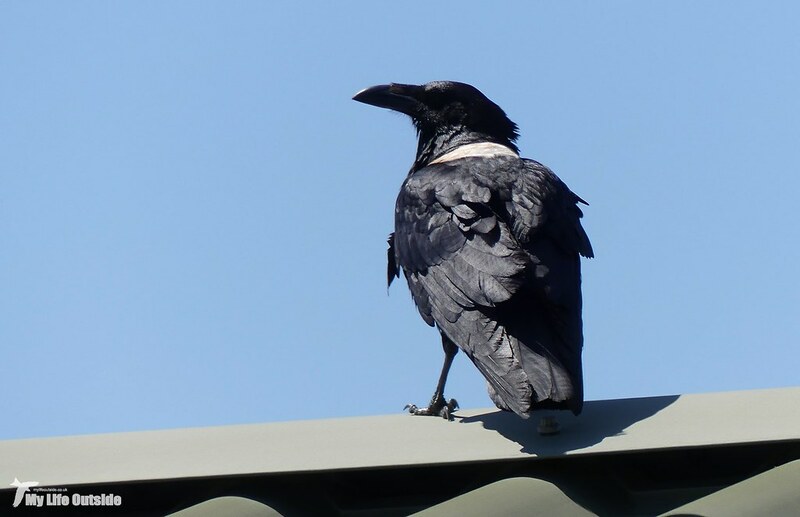 Immediately distinguishable from our native species thanks to that plumage it also looked much larger in comparison, though that may simply be because I never normally manage to get this close to Crows. The caravan’s owner was incredibly kind, not only permitting me to take photos but also putting out bacon on which to feed (the Crow that is, not us). After the fish and chips in Cromer this is certainly going to be one well fed bird. We spent a good half hour or more enjoying the Pied Crow’s presence before finally dragging ourselves away to explore more of this fabulous coastline. In that brief time we made a couple of interesting observations. 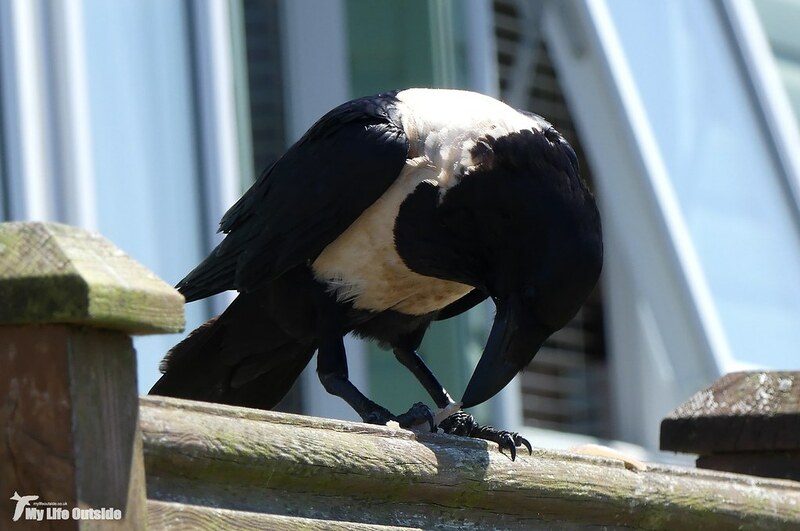 Firstly the Pied Crow is indeed very tame. At times it would approach to within a couple of metres and on occasion even acted as if it was demanding to be fed, following our host until she produced more food. Secondly it’s capable of producing some very odd and unusual calls. 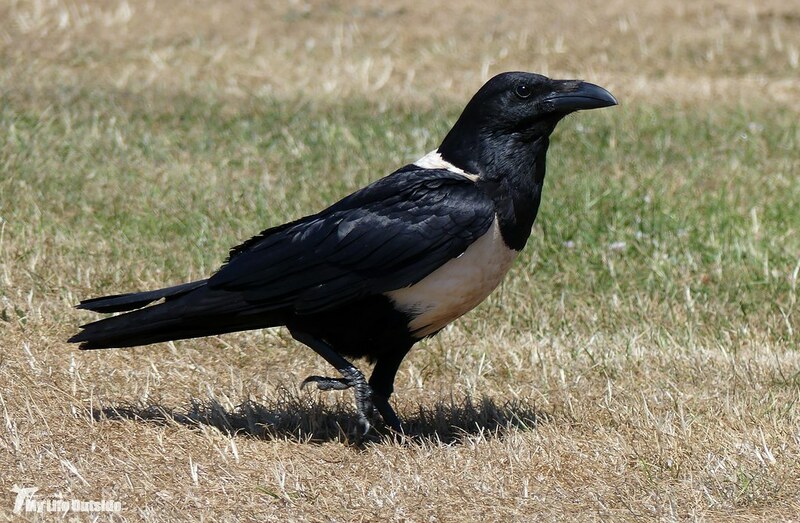 Its predominant vocalisation is a squawk not too dissimilar to our own Carrion Crows but it would alternate that with a series of rapid knocking sounds, often directed directly at the ground. I should really have videoed this as its far harder to explain in words but we wondered if this might either be in an effort to draw worms to the surface or that the hard baked ground was acting as an amplifier bouncing the sounds back across a much wider area. Either way it was fascinating to watch and well worth the visit alone. 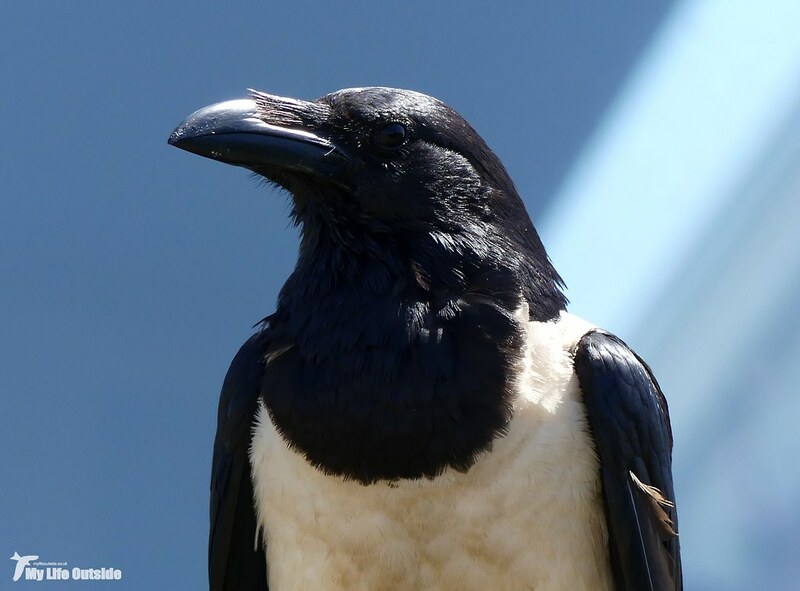 Although the Pied Crow stuck around for most of the time it did make occasional excursions off to places unknown. Our earlier search had managed to coincide with one of these absences perfectly. It always returned though and with plenty of bacon on offer, who could blame him. Regardless of origin then this turned out to be a thoroughly enjoyable and engaging bird with which to spend time. Add in some lovely people and glorious views and the question becomes less should I visit and more, why haven’t I visited yet. Trust me, you won’t regret it.